Langdon Street Cafe, Montpelier, Wednesday, March 19, 7 P.M. Marking the five-year anniversary of the war, "Beyond Iraq: A Community Discussion" was a public forum organized by the band Pariah Beat. 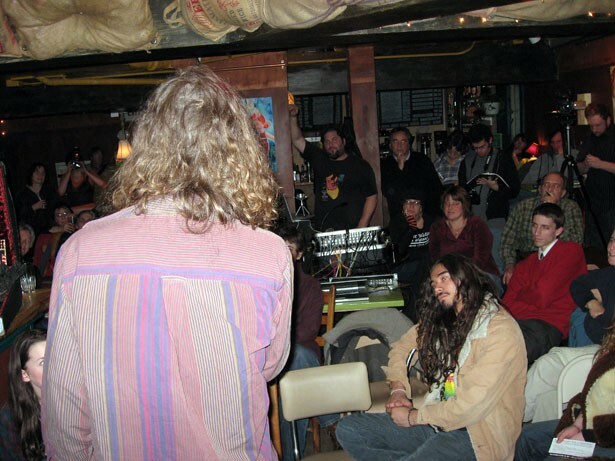 With twentysomething antiwar demonstrators, political candidates, press, '60s-era veterans and others, it was standing-room-only at Langdon Street Café during the two-hour discussion. The forum had no scheduled speakers or explicit agenda. Participants simply passed a mike and said what they had to say. Subject matter included: Winter Soldier, the General Dynamics protest, the Vermont Impeachment movement, specious justifications for the war and its continuation. But one subject drew particular fire from the speakers: mainstream media and its portrayal of the war and foreign affairs. The event also offered a sneak peek at what could be a colorful Progressive gubernatorial race. Worcester horse logger Michael Colby was on hand to announce his candidacy for governor on the Prog ticket. He assured the group that, whether they support Obama, Clinton or McCain, "Electing a new president is not going to stop the war in Iraq." Colby concluded by quoting, then revising, Marx: "Elections are the opiate of the masses!" This came after rival Prog Anthony Pollina spoke on the power of protest and the vested interests of mainstream media. Pollina, who has been courting the support of Democrats, took a decidedly more moderate route. Perhaps the most unique voice at the event belonged to an Iraq veteran. He shared skepticism about the media's treatment of the war, but he also expressed concerns that a precipitous withdrawal could have a detrimental effect on the region's stability. Having experienced the situation firsthand, he remained cautious about armchair policy-making and easy answers. Afterwards, the band cranked out protest songs and roots-based rock until closing time. They also displayed the boots of deceased local soldiers on stage. Describing Pariah Beat as "socially conscious but not overtly political," band member Nick Charyk was glad the event attracted a diverse audience, and that it turned out to be different from the typical didactic peace vigil. "I get frustrated at some activist things that are super-lefty and just preaching to people who already agree," he said. "We're not trying to bring everyone to a certain conclusion," added band member Billy Sharff, summing up the event, "but as musicians, we can bring people together and stir up some ideas." Mission accomplished.